The term empowerment is also used for an accomplished state of self-responsibility and self-determination. Sociological empowerment often addresses members of groups that social discrimination processes have excluded from decision-making processes through - for example - discrimination based on disability, race, ethnicity, religion, or gender. Empowerment as a methodology is also associated with feminism. One empowerment strategy is to assist marginalized people to create their own nonprofit organization, using the rationale that only the marginalized people, themselves, can know what their own people need most, and that control of the organization by outsiders can actually help to further entrench marginalization. Charitable organizations lead from outside of the community, for example, can disempower the community by entrenching a dependence charity or welfare. A nonprofit organization can target strategies that cause structural changes, reducing the need for ongoing dependence. Red Cross, for example, can focus on improving the health of indigenous people, but does not have authority in its charter to install water-delivery and purification systems, even though the lack of such a system profoundly, directly and negatively impacts health. A nonprofit composed of the indigenous people, however, could ensure their own organization does have such authority and could set their own agendas, make their own plans, seek the needed resources, do as much of the work as they can, and take responsibility - and credit - for the success of their projects (or the consequences, should they fail). Lorenzo Cotula in his book ' Legal Empowerment for Local Resource Control ' outlines the fact that legal tools for securing local resource rights are enshrined in legal system, does not necessarily mean that local resource users are in position to use them and benefit from them. The state legal system is constrained by a range of different factors - from lack of resources to cultural issues. Among these factors economic, geographic, linguistic and other constraints on access to courts, lack of legal awareness as well as legal assistance tend to be recurrent problems. Gender empowerment conventionally refers to the empowerment of women, and has become a significant topic of discussion in regards to development and economics. It can also point to approaches regarding other marginalized genders in a particular political or social context. 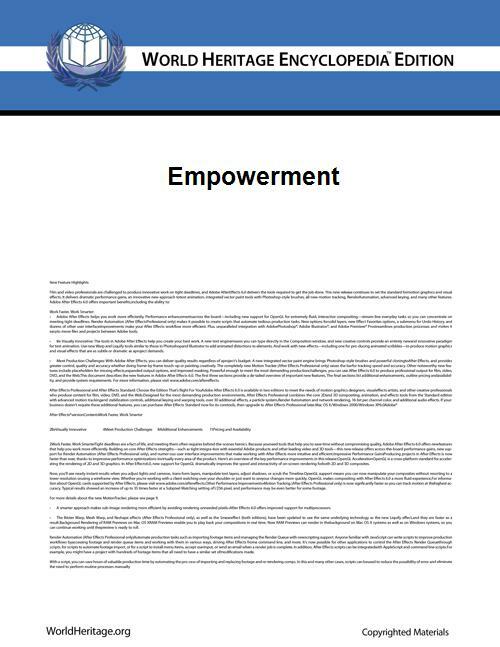 This approach to empowerment is partly informed by feminism and employed legal empowerment by building on international human rights. Empowerment is one of the main procedural concerns when addressing human rights and development. The Human Development and Capabilities Approach, The Millennium Development Goals, and other credible approaches/goals point to empowerment and participation as a necessary step if a country is to overcome the obstacles associated with poverty and development. In the sphere of workers generally) greater discretion and resources: distributing control in order to better serve both customers and the interests of employing organizations. During the 1980s and 1990s, empowerment has become a point of interest in management concepts and business administration. In this context, empowerment involves approaches that promise greater participation and integration to the employee in order to cope with their tasks as independently as possible and responsibly can. A strength-based approach known as "empowerment circle" has become an instrument of organizational development. Multidisciplinary empowerment teams aim for the development of knowledge management contributes significantly to implement employee participation as a guiding principle, for example through the creation of communities of practice. ^ Vgl. Albert Lenz: Empowerment und Ressourcenaktivierung – Perspektiven für die psychosoziale Praxis. Thomas, K. W. and Velthouse, B. A. (1990) "Cognitive Elements of Empowerment: An 'Interpretive' Model of Intrinsic Task Motivation". Academy of Management Review, Vol 15, No. 4, 666-681.